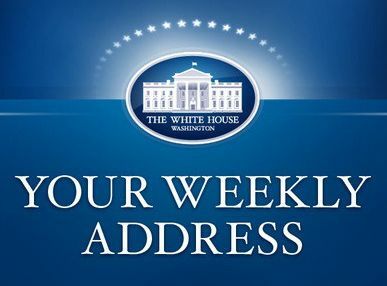 WASHINGTON, DC — In this week's address, the President spoke to the merits of the high-standards trade agreement reached this past week. The Trans-Pacific Partnership helps level the playing field for American workers and businesses, so we can export more Made-in-America products all over the world, supporting higher-paying American jobs here at home. The President acknowledged that past trade agreements have not always lived up to expectations, but emphasized that this is a good deal, with the strongest commitments on labor and environment of any trade agreement in history. It reflects America’s values and gives our workers the fair shot at success they deserve. The President encouraged everyone to read the agreement, which will be available online well before he signs it, and looked forward to working with lawmakers from both parties as they consider and approve this deal. Hi, everybody. This week, after five years of effort with eleven other nations, we reached agreement on a new trade deal that promotes American values and protects American workers. There’s a reason this Trans-Pacific Partnership took five years to negotiate. I wanted to get the best possible deal for American workers. And that is what we’ve done. Here’s why it matters. Ninety-five percent of the world’s consumers live outside our borders -- 95 percent. They want to buy American products. They want our cars; our music; our food. And if American businesses can sell more of their products in those markets, they can expand and support good jobs here at home. So it’s no wonder that exports played a huge role in helping America recover from the Great Recession. In fact, last year, we set a new record for American exports for the fifth year in a row, selling more than $2 trillion in goods and services. Our exports support roughly 12 million American jobs -- and they’re jobs that typically pay better than other jobs. But here’s the thing: Outdated trade rules put our workers at a disadvantage. And TPP will change that. Right now, other countries can cut their costs by setting lower standards to pay lower wages. This trade agreement, TPP, will change that, holding partner countries to higher standards and raising wages across a region that makes up nearly 40 percent of the global economy. Right now, other countries charge foreign taxes on goods that are made in America. Japan, for example, puts a 38 percent tax on American beef before it even reaches the market. Malaysia puts a 30 percent tax on American auto parts. Vietnam puts taxes as high as 70 percent on every car American automakers sell there. Those taxes and other trade barriers put our workers at a disadvantage. It makes it more expensive to make goods here and sell them over there. Well, TPP is going to change that. It eliminates more than 18,000 of these taxes on American goods and services. And that way, we're boosting America’s farmers, ranchers, manufacturers, and small business owners -- make it easier for them to sell their products abroad. That’s what it means to level the playing field for American workers and businesses. And when the playing field is level, and the rules are fair, Americans can out-compete anybody in the world. Now, I’m the first person who will say that past trade agreements haven’t always lived up to their promise. Sometimes they’ve been tilted too much in the direction of other countries and we haven't gotten a fair deal. And that makes folks suspicious of any new trade initiatives. But let’s be clear. Our future depends not on what past trade deals did wrong, but on doing new trade deals right. And that's what the TPP does. It includes the strongest labor standards in history, from requiring fair hours to prohibiting child labor and forced labor. It includes the strongest environmental standards in history. All these things level the playing field for us, because if they have to follow these rules, then they can't undercut us and sell their products cheaper because they’re violating these rules. And unlike past trade agreements, these standards are actually enforceable. Without this agreement, competitors that don’t share our values, like China, will write the rules of the global economy. They’ll keep selling into our markets and try to lure companies over there; meanwhile they’re going to keep their markets closed to us. That’s what’s been going on for the last 20 years. That's what’s contributed so much to outsourcing. That's what has made it easier for them to compete against us. And it needs to change. With this Trans-Pacific Partnership, we are writing the rules for the global economy. America is leading in the 21st century. Our workers will be the ones who get ahead. Our businesses will get a fair deal. And those who oppose passing this new trade deal are really just accepting a status quo that everyone knows puts us at a disadvantage. Look, you don’t have to take my word for it. In the coming weeks and months, you’ll be able to read every word of this agreement online well before I sign it. You’ll be able to see for yourself how this agreement is better than past trade deals -- and how it’s better for America’s working families. You can learn more at WhiteHouse.gov. And I look forward to working with both parties in Congress to approve this deal -- and grow our economy for decades to come. Thanks, everybody. And have a great weekend.